W.M. 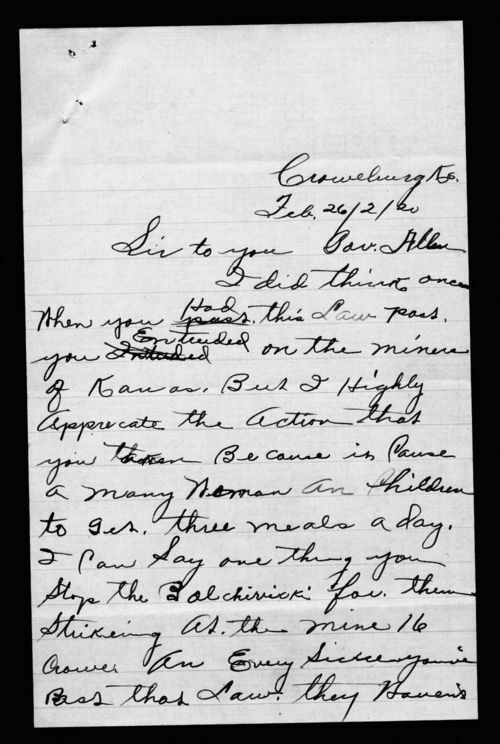 Nelson, a black miner in Croweburg, Kansas, writes Governor Allen about pending legislation involving the Court of Industrial Relations. This legislation would have a panel in charge of hearing both sides of labor disputes. Nelson writes "I did think once when you had this law pass you entruded on the miners of Kansas. But I highly appreciate the action that you taken because it cause many woman an children to get three meals a day." Nelson goes on to say "This is the first time in history that the colored miner had one part of a show in District 17." The Court of Industrial Relations was later passed on January 1920 by special session of the Kansas legislature.